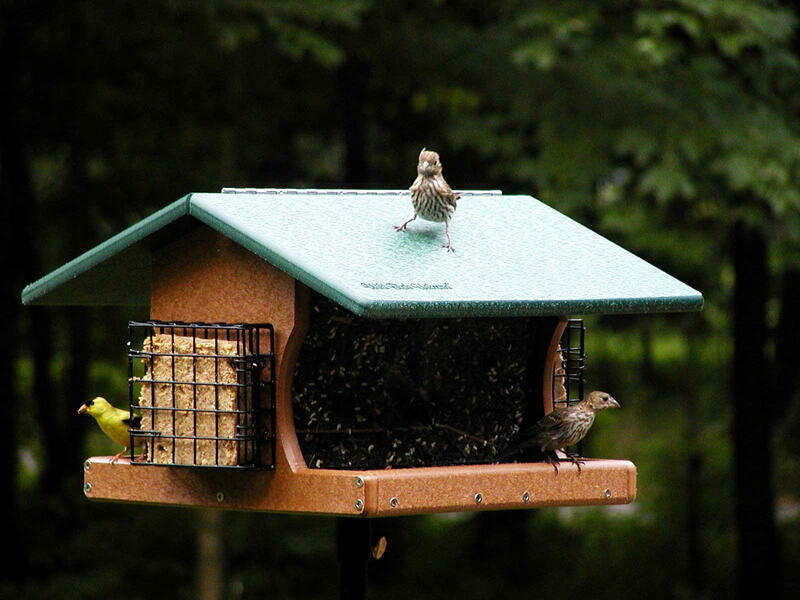 One of the most popular feeders at the Wild Birds Unlimited - East Lansing, MI store is our huge recycled plastic hopper feeder. The EcoTough® Ranchette Retreat bird feeder is a fully functioning bird buffet that holds two gallons of seed and two suet cakes. This feeder attracts many different bird species such as cardinals, finches, jays, chickadees, woodpeckers and more. To protect the seed, the Ranchette Retreat has an extra large green roof that overhangs the extra large tray area. This will accommodate large and small birds comfortably. It also has a mesh screen bottom with a built in seed diverter to keep seed moving through the feeder smoothly and to prevent moldy seed. It mounts to a 4” x 4” easily or on our Advanced Pole System (APS). This is one of the easiest feeders to clean. The recycled plastic doesn’t fade, crack, or split. The plexi-glass front and screen bottom are removed easily. Its dimensions are: 11" x 16¼" x 17¼". EcoTough® feeders are environmentally friendly, high quality products that are made from recycled plastic milk jugs. They are more expensive than the cedar hoppers but they are hand crafted in Chilton, Wisconsin and come with lifetime guarantee. The recycled feeders are wonderful and sturdy. Mine has been outside in the brutal Texas sun for over a year, and shows no signs of fading.